4 Hugues Ross - Blog: Halberd Update 4 - Watch this! It's been too long since my last Halberd update, but rest assured: I've been hard at work. 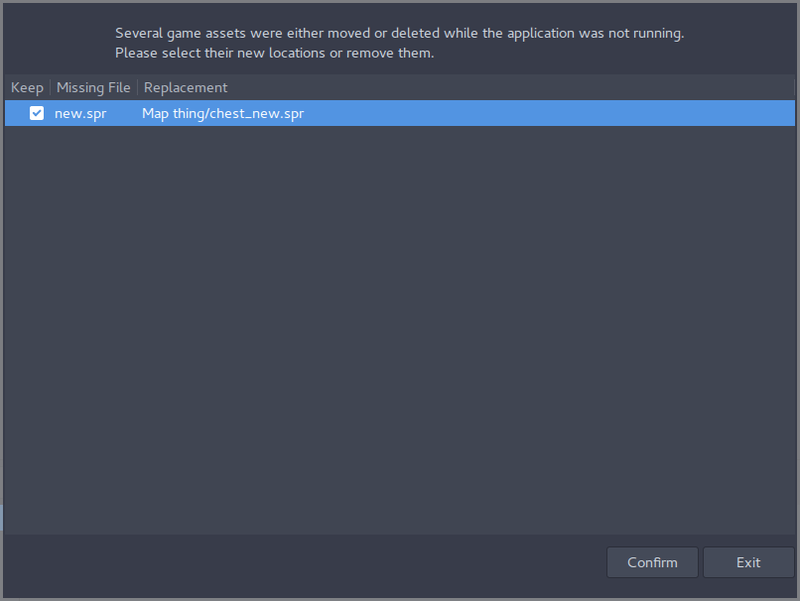 The registry can automatically tell when an asset has been changed outside the editor, and can prompt the user for more information. I was been aware for a while that if I didn't create some method for handling assets and their relationships with each other, I was going to be in a world of hurt later. Over break, I spent a lot of time considering my options and came up with the asset registry. The asset registry is a special container that records assets and assigns numerical IDs to them. The engine can report changes to the locations/names of registered assets, and the registry will change accordingly. Then, assets that depend on them can refer to them with their ID, and never have to worry about moves or deletions. Whenever you make some sort of connection between an asset and another, the depended asset is automatically registered (unless it exists in the registry, in which case the ID is returned). This makes managing assets extremely simple and straightforward. For a long time, I've had to make most assets by writing config files, DFEngine style. This is a horribly slow, boring, and imprecise way to actually produce a game, so I've started making views in the editor for designing and editing various game objects. So far, I've finished the first pass on the Actor editor and I've started on the Sprite editor. I've got a lot of work on my plate, so progress here has been a bit slow. 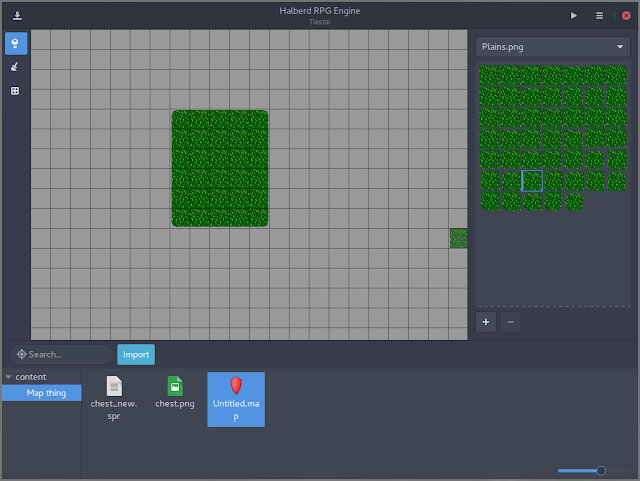 I've also added a tile selection pane to the map editor. Not only can you choose specific tiles to place, you can also add new tilesets to a map and save them into the map file as well! I made this before the asset registry, so it needs some adjustments in order to fall in line with the rest of the asset editors. The tile selector is also a bit slow sometimes. I'll need to look into this in the future. One thing that I've wanted in my engines for a while is a better way to log information and errors. After taking some time to work out logging in Halberd, I think I have a decent system. Using variadic macros, I've made logging fuinctions that can take arguments in the same way that printf can. This alone is a huge boon, as far as getting information goes. On top of that, I've added a simple way to add a callback function for logging. I'm not using any at the moment, but once I get the chance I'll be adding popups for error messages and a logging window to search, filter, and examine messages from the editor. Of course, what real good is such a nice log, if I can only use it for a single project? As I mentioned in my 2015 retrospective, I want to have a few basic libraries to make development simpler. I've started work on DFGame, a game engine utility library, and so far I'm happy with the results. Much of my resource handling and logging code has been added already, and I'll be adding much more in the near future. 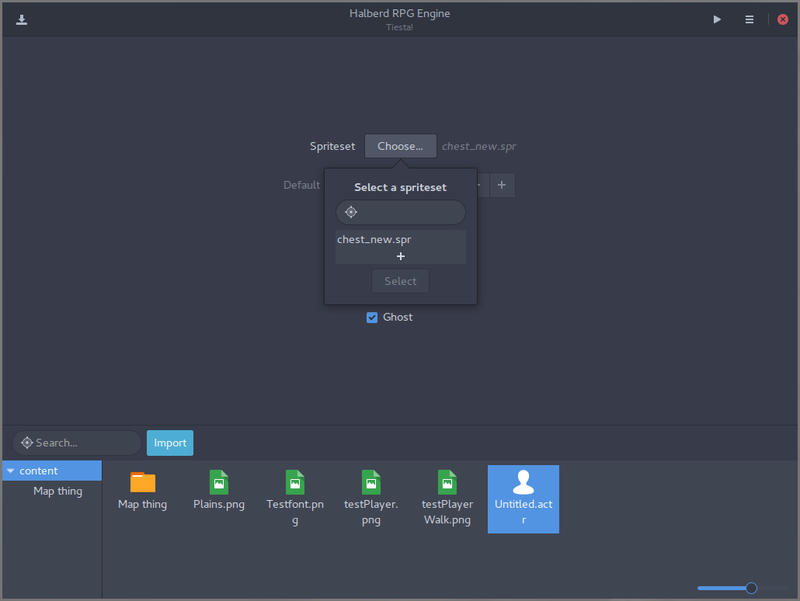 By doing this, I've been able to rip several files straight out of Halberd and into DFGame, which has the added benefit of making Halberd's codebase just a tad smaller and simpler. I'm hoping that in a couple of months I'll have enough in there to give me an easy jumpstart on any new game projects.